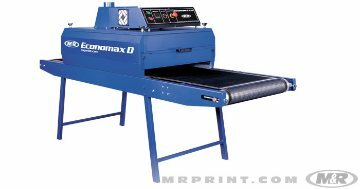 Easy to own and economical to operate, Economax D is the ultimate affordable, space-saving infrared electric screen printing conveyor dryer. Not only does it have the highest production capacity in its class of conveyor dryers, it’s also the most energy efficient. Heavy-duty thermal insulation prevents heat from migrating into the workplace, while CoolSkin™ technology leaves the dryer skin cool to the touch. Fast cure rates and high product throughput maximize conveyor dryer capacity and minimize per-unit cost. Economax D cures with twin height-adjustable energy-efficient infrared panels. It features a 61 cm (24") Teflon®-coated fiberglass conveyor dryer belt, and can be equipped with a third radiant panel for increased dryer production capacity. A reliable, heavy-duty DC motor provides power, and Economax D’s Proportional Integral Differential (PID) Control allows the conveyor dryer to power up gradually to avoid maximum amperage loads during initial warmup. PID also helps maintain even temperatures during production by phasing on and off rather than using the full-load/no-load approach. The control panel operates and displays temperature and conveyor belt speed. Process temperatures and set temperatures are controlled digitally. Temperature consistency is ensured by a fuzzy-logic controller, which responds to ambient temperature changes by keeping the conveyor dryer chamber heat within 1° of target temperature at the thermocouple. Entry and exit openings are adjustable, and large, crowned rollers ensure positive conveyor belt tracking. An automatic shutdown sequence keeps the dryer’s blower and belt running until the conveyor dryer chamber has cooled. This rugged, affordable dryer is designed for years of dependable performance. Combined with a manual press and a registration system like M&R’s Tri-Loc, Economax D is a perfect electric screen printing conveyor dryer for small and startup screen printing shops and an ideal sampling dryer in mid-size screen printing shops. M&R is the world’s largest manufacturer of screen printing equipment, and the online M&R Store features a wide variety of genuine M&R OEM parts and screen printing supplies. M&R’s line of screen printing conveyor dryers includes infrared electric screen printing dryers and propane and natural gas screen printing dryers. 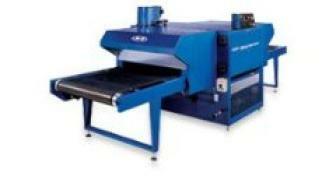 And M&R sets the industry standard for all screen printing dryers. Each M&R dryer carries the highest production capacity and delivers the greatest energy efficiency of any screen printing dryer in its class. M&R conveyor dryers are complemented by M&R’s wide array of ancillary screen printing machines and professional screen printing equipment. All equipment from the M&R Companies is built with M&R's unsurpassed attention to detail and commitment to quality, durability, innovation, and design excellence, and is backed by M&R’s unparalleled 24-hour access to service, support, and premium parts. 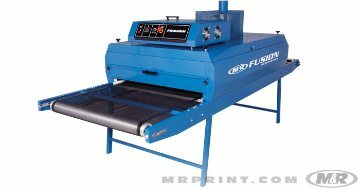 Easy to own and economical to operate, Fusions are M&R’s most affordable 91 cm (36”), 122 cm (48”), and 152 cm (60”) infrared electric textile dryers, and they’re available in 183 cm (6’) and 305 cm (10’) heat chamber lengths. Fusion’s thermal insulation helps prevent heat from migrating into the workplace. That means more heat stays in the dryer chamber, reducing energy costs. Fast cure rates and high product throughput maximize dryer capacity and minimize per-unit cost. Aggressively priced and impressively designed, Fusion is a perfect choice for operations ranging from small manual shops to mid-size automated shops. Fusion cures with height-adjustable energy-efficient infrared panels. A reliable, heavy-duty DC motor powers a heat-resistant, Teflon®-coated fiberglass conveyor belt. Process temperatures and set temperatures are controlled digitally. Temperature consistency is ensured by a fuzzy-logic controller, which responds to ambient temperature changes and dryer load conditions while keeping chamber heat within 1° of target temperature at the thermocouple. Entry and exit openings are adjustable, and large, crowned rollers ensure positive belt tracking. An automatic shutdown sequence keeps the blower and belt running until the chamber has cooled. On its side with legs folded, Fusion can fit through a 78 cm (31”) doorway. This rugged, affordable dryer is designed for years of dependable performance. Combined with a manual press or small automatic and a registration system like M&R’s Tri-Loc, Fusion makes a perfect production dryer in small shops or an ideal sampling dryer in mid-size shops. 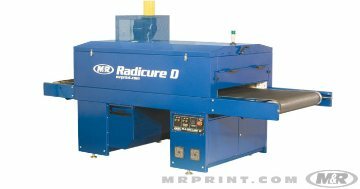 Built for long life and maximum performance, Radicure D is M&R's premium infrared electric textile dryer. It's available in belt widths from 91 to 152 cm (36” to 60”). Not only does it have the highest production capacity in its class, it’s also the most energy efficient. The heavy-duty thermal insulation in M&R’s patented suspended-fabric insulating system prevents heat from migrating into the workplace, while CoolSkin™ technology leaves the dryer skin cool to the touch. Fast cure rates and high product throughput maximize dryer capacity and minimize per-unit cost. Curing is provided by an infrared radiant panel array and forced hot air. Panels can be quickly and easily raised and lowered with convenient single-point height adjustment. Separate dedicated blowers power circulation and exhaust. Radicure D’s Proportional Integral Differential (PID) Control allows the dryer to power up gradually to avoid maximum amperage loads during initial warmup. PID also helps maintain even temperatures during production by phasing on and off rather than using the full-load/no-load approach. The control panel allows easy monitoring and adjustment of operational status, temperature, and belt speed settings. Process temperatures and set temperatures are controlled digitally. Temperature consistency is ensured by a fuzzy-logic controller, which responds to ambient temperature changes by keeping chamber heat within 1° of target temperature at the thermocouple. A tower light shows when temperatures are within user-set parameters. Entry and exit openings are adjustable, and large, crowned rollers ensure positive belt tracking. Maintenance is simplified with easy-to-reach filters and lubrication points. An automatic shut-down sequence keeps the blower and belt running until the chamber has cooled. Designed for tight places and tight budgets, Mini Sprint 2000 offers exceptional performance in a compact, affordable gas dryer. It's available in 97 cm (38") belt widths. Not only does it have the highest production capacity in its class, it’s also the most energy efficient. Heavy-duty thermal insulation prevents heat from migrating into the workplace, while CoolSkin™ technology leaves the dryer skin cool to the touch. Fast cure rates and high product throughput maximize dryer capacity and minimize per-unit cost. Available in liquid propane (LP) or Natural Gas (NG), the high-performance burners are designed with excess capacity that far exceeds consumption rates under normal operating conditions. Separate blowers control combustion, circulation, and exhaust. A high-volume forced air system quickly brings the chamber to the desired temperature, speeding the start of production. Process temperatures and set temperatures are controlled digitally. Temperature consistency is ensured by a fuzzy-logic controller, which responds to ambient temperature changes by keeping chamber heat within 1° of target temperature at the thermocouple. A tower light shows when temperatures are within user-set parameters. When readings fall outside those settings, a temperature monitor issues visible and audible alarms. Entry and exit openings are adjustable, and large, crowned rollers ensure positive belt tracking. Digital speed readout makes it easy to duplicate settings. An automatic shutdown sequence keeps the blower and belt running until the chamber has cooled.